WASHINGTON (CN) – Bad news for the millions of Americans on food stamps: The Trump administration plans to propose a rule Thursday to restrict states’ abilities to provide federal food assistance to people who are not steadily employed. 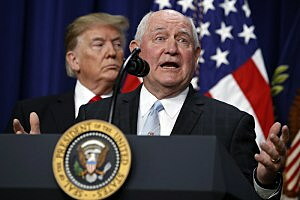 Proposed by the U.S. Department of Agriculture, the policy change follows Congress’s passage of a $400 billion farm bill. While the bill barely altered the Supplemental Nutrition Assistance Program (SNAP), House members attempted to slip in provisions to make it more difficult to qualify for and remain on the government assistance program. This included expanding the age range of recipients obligated to work at least 20 hours per week from 18-49 to 18-59, requiring those with children older than six to complete job training, and restricting the requirements under which families can qualify for SNAP automatically. While President Donald Trump endorsed the House’s proposed changes, the Senate did not. Trump ultimately supported the farm bill without the SNAP alterations but ordered the USDA to come up with proposals for restrictions on its own. States currently have the authority to waive limitations placed on “work-eligible able-bodied adults without dependents” out of compliance with the 20-hour work requirement when their unemployment rates are above 10 percent. These individuals would otherwise only be eligible to receive three months of SNAP benefits over three years. The USDA’s proposition would take away states’ abilities to waive those requirements unless a city or county has an unemployment rate of 7 percent or higher. Those cities would be eligible for a one-year waiver with the support of their state’s governor. The new limitations would also prevent states from granting benefit extensions, which they are currently able to do for up to 15 percent of their work-eligible adult population without a waiver. It would also prevent states from stockpiling these exemptions for later use. The proposed rule already has its critics. Senator Bernie Sanders, I-Vermont,‏ tweeted earlier today voicing his opposition. Dan Glickman, who served as USDA secretary from 1995-2001 also disapproved of the Trump administration’s move. The USDA must now take public comment on the proposal.